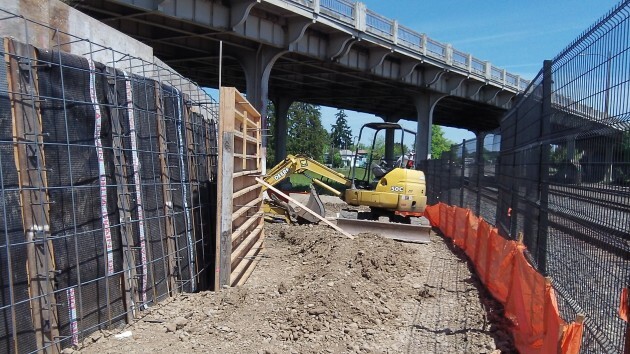 Forms for retaining walls are being built along the new path under the Pacific Boulevard viaduct. For a few weeks now, a contractor for ODOT has been building a new walking or “multi-use” link between Albany Station and Swanson Park underneath the Pacific Boulevard overpass. As the last piece of the depot renovation it’s a welcome development, even though it also makes you wonder about transportation priorities. There’s already a path on the other side of the overpass, connecting the same two points in the city’s geography. But users of the existing connection have to wait at a couple of crosswalk traffic lights, something the new trail will allow them to avoid. In case the fence lining the path is not enough to get the message across. The new path, along the Union Pacific mainline, was part of the original depot project, so now it’s being built, paid for with federal transportation funds. ODOT awarded the $383,692 construction contract to HP Civil Inc., the low bidder, last year. (The company is based in Dallas but has a Salem office, ODOT told me last year.) 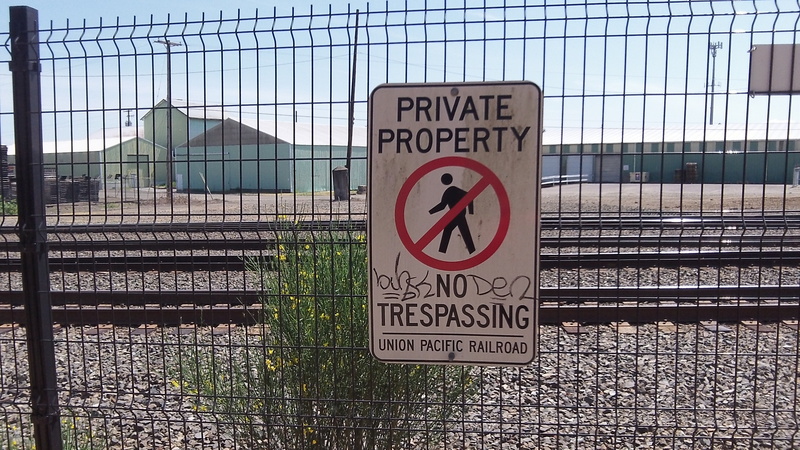 Construction was to be done in 2014 but was delayed when it was discovered no one had asked the Union Pacific for its OK. The idea of this path is to provide another link between the station and the neighborhood around Swanson Park and its summertime pool on the other side of the Pacific viaduct. It’s being cut into the foot of the embankment holding up the road, so it requires sturdy retaining walls. I’m betting that kids who ride the bus and walk to the pool on this path will be immediately reported to Child Protective Services and their parents/guardians arrested shortly thereafter by APD. Maybe not by the police, but possibly by some overeager busybody who thinks children must not be allowed out of sight lest they become a victim in this cruel world.